Serenity, quiet, scale. These are all features that make Antietam National Battlefield a splendid and thought-provoking detour from the busy Interstate 81 and 70 nexus in MD (as well as ready access from other routes). If you’re just traveling through, or doing a swing through Civil War sites at Gettysburg, Harper’s Ferry, and Monocacy, plan to spend some time at Antietam, perhaps 2-3 hours or half a day. Antietam National Battlefield is different from the other three. Smaller in scale than Gettysburg, in humble fields where Harper’s Ferry is a town, more remote than Monocacy, less busy than the others. One day at Antietam was the bloodiest single-day battle in the history of the US ( specifics HERE). 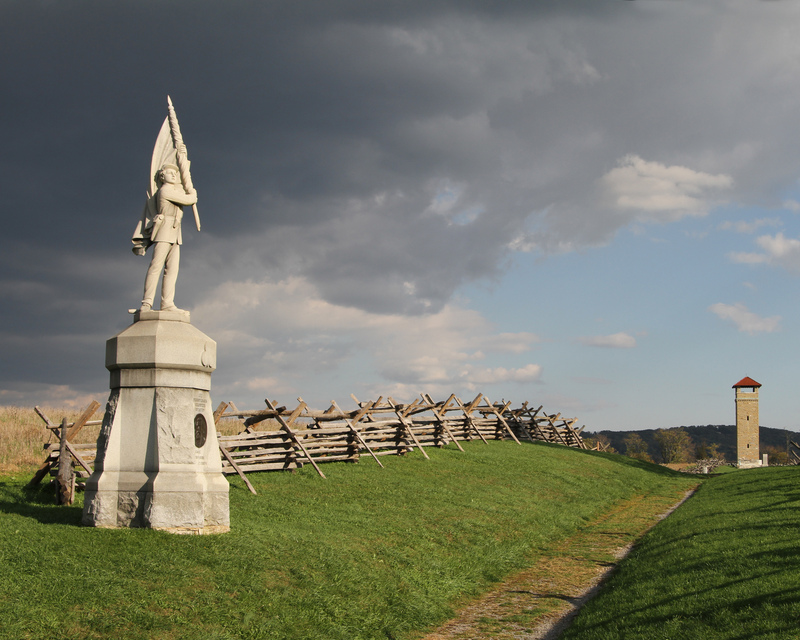 A visit to Antietam, IMBHO, is about experiencing that reality as much as it is about absorbing historical detail. Antietam National Battlefield is a very accessible site in many respects. You can see the battlefield unfurling before you in rolling meadows, woods, and a cornfield, you can take a walk through key points or more of a hike. You can drive a marked auto tour and stop to take in the landscape. You can get out and absorb the atmosphere on accessible pathways. Though rolling and mellow, the ground can be uneven: be sure to wear your sturdy shoes. Your trekking poles may be handy as well. You can look over the scope of the battlefield. All of it. You can truly be in it, sense the pain of the massacre and the fear of the troops from the very ground under your feet, the roll of the cannons, and the death all around. The brutality and desperation. Antietam is at once serene and disturbing. No affection for military history required…. Even if you have no prior knowledge of Antietam battle movements, even if you’re not into military history and aren’t really interested in learning, there’s so much to experience and contemplate. If you like living history…. There are 3 weekends in 2017 that are focused on live experiences. They are June 24-25 Living History Weekend July 22-23 Artillery Weekend August 26-27 doublecheck with park for dates and if there are extra costs. The little town of Sharpsburg on the verges of the battlefield will be worthy of exploration as well. Take some time to wander around and sense how a small settlement could unwittingly be drawn into a massacre. Photo credits4. Top and featured image…Antietam house and cannon with blossoms: CC0 via Pixabay. Bloody Lane: Courtesy NPS. The cornfield, Antietam National Battlefield: CC BY 2.0 by David McSpadden via Flickr. Burnside Bridge: CC0 via Pixabay. RCS_7874 – 150th Antietam Reenactment: CC BY-SA 2.0 by Craig Shipp via Flickr.